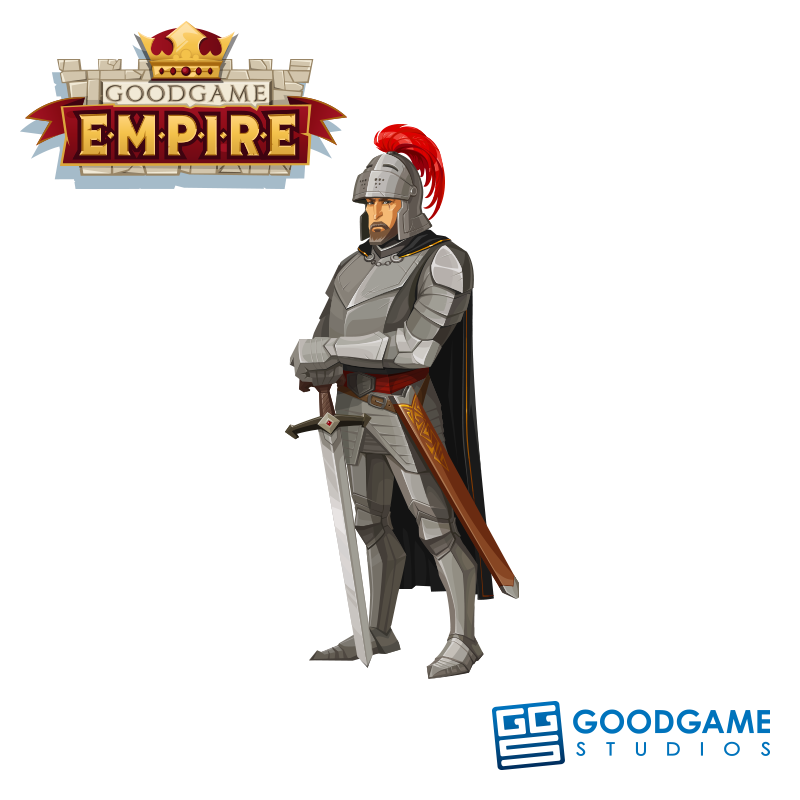 A successful castle lord knows that you can’t get far in Goodgame Empire without a strong strategy, so we took a peek at Sir Ulrich’s commander’s logbook and decided to share his tips with you right away! Be the first to find out how a clever ruler leaves the robber barons defeated at his gate and how you can plan your next attack to be as successful as possible. The day started out quiet. The woodcutters and stonemasons were cheerfully going about their work. But then one of our scouts sounded the alert – enemy troops were marching towards the castle, and they were armed to the teeth! An experienced strategist always remains calm, though. “Ulrich, remember to think tactically,” I reminded myself. I immediately check our defense. Our walls must be protected by enough strong warriors so I go straight to the barracks to recruit more units. As soon as I can see the arrangement of the enemy’s approaching army, I adjust the mix of ranged and melee soldiers on my castle walls accordingly. This is because I know that ranged defenders are best against ranged attackers, and melee defenders stand a better chance against melee attackers. Of course we can’t forget about the tools! My men and I get all of the flaming arrows and tar pitch kettles into position. 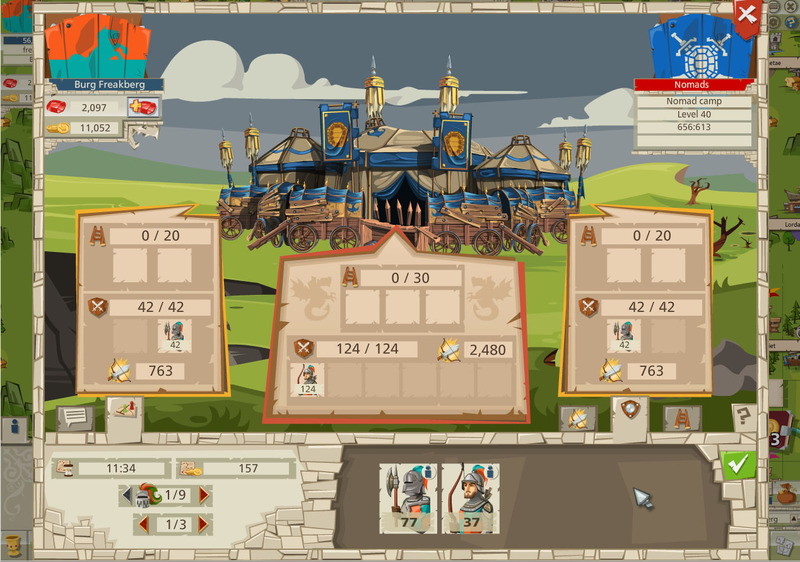 The enemy army is big – good that I still have other troops stationed at the nearby outposts! I give the order to send those troops to my main castle to support their brothers in defense. My strong allies give me a great advantage. I contact my alliance and ask for their help. They quickly send over their troops to assist my own. I call for my castellan post haste and assign him the equipment and weapons he needs to lead my brave soldiers in upholding the castle’s defense. My bowmen and swordsmen stand side by side with their allied troops. The tar pitch kettles are in position, the castle gate is secured, the castellan equipped. Only one minute left – ready yourselves, men! The skirmish is over in the blink of an eye, and as I look at the battle report placed before me, I raise my fist in the air – victory is ours! We sent the enemy back home with their tail between their legs. The wounded are now being treated in the military hospital while new soldiers are recruited in the barracks. This attack should not go unanswered! I order my troops to prepare themselves for the counterattack. I send my spies out to find out what they can about this traitor’s castle. Here I must exercise extreme caution: the more spies I send out, the more precise their information will be. But at the same time, having more spies increases the chances of getting caught. Luckily they slipped by without a sound, and I soon hold the espionage report in my hands: 60 defense units and 25 defense tools. The enemy’s weak defense means it will be easy for me to devise the perfect attack strategy. Ranged defenders are best defeated with melee attackers, and melee defenders with ranged attackers. 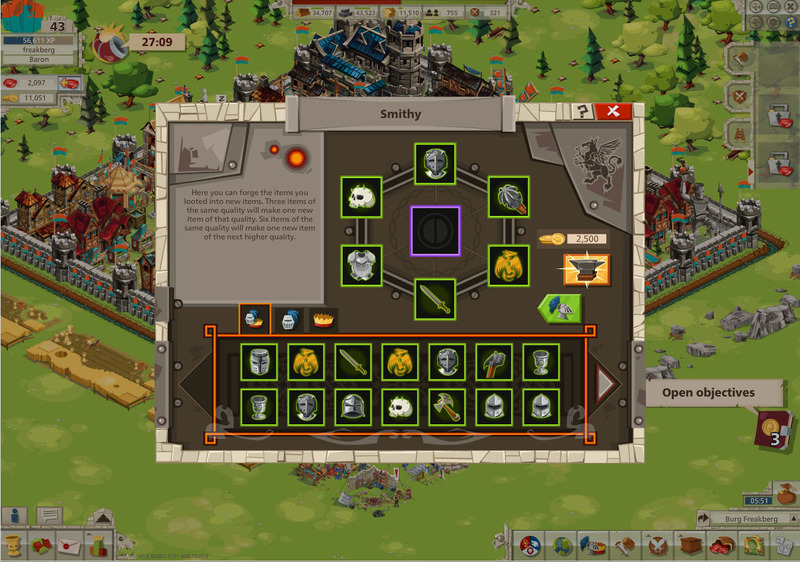 My blacksmiths are hard at work building the last of the attack tools in the siege workshop. These will prove useful in overcoming our opponents’ walls and gates. I give my most capable commander a legendary helmet, the best equipment available, so that my troops can have a powerful leader at their head. As a clever tactician, I must ensure that my attack plan allows for all eventualities. I carefully check my enemy’s diplomatic status. He’s not in an alliance – excellent! This means I won’t have to worry about any support coming in from his allies. The last thing I do is to send more spies to his outposts to learn about the current situation there. The enemy has only a few units stationed there, no cause for worry. My strongest and bravest warriors eagerly await the battle ahead. At their head stands my proud commander, brilliant in his legendary armor. The battering rams and siege towers are in position to bring this enemy castle to its knees. I assign each unit to a flank or to the front and give the signal to attack. Shortly after the troops arrive, flames flicker over the castle walls. That can only mean one thing: victory! It is done, the foe has been defeated, the retaliation was successful. This evening we will throw a huge feast in the tavern to celebrate our rich loot! But there’s no such thing as vacation in the Great Empire – the end of one campaign is just the beginning of another!